Sorry this blog came late, it has been quite a hectic week on the development side of the game. What I have for you today is not the most exciting thing to read, but has been asked for by many people through comments and emails. This is a summarized version of instructions, to give people a brief idea of how to play. Also, at the bottom, there is a video that plays through some of the game, for those who are more visual learners. I hope to have another more exciting blog out before next Thursday, but we are getting very close to the Kickstarter and spare time is becoming much harder to find. 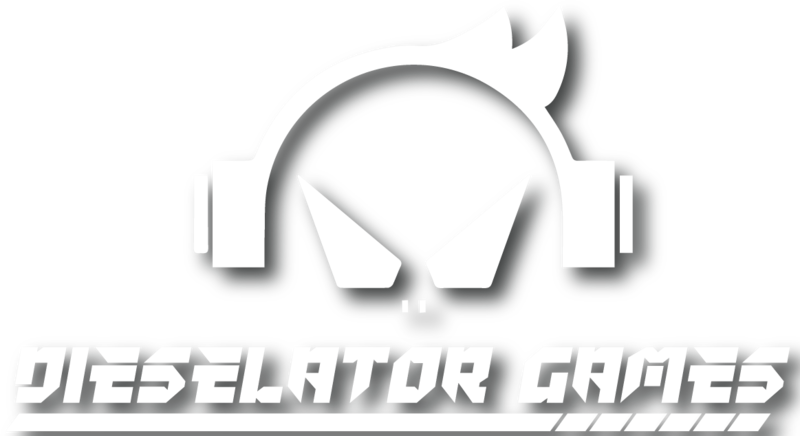 If there is anything I didn't cover here that you want to know more about, don’t hesitate to comment or send me an email at dieselatorgames@gmail.com. The game is made for 2 people to face off against one another. A single game lasts 20-45 minutes. The game takes place in the broken world of Ethalios. Scorched by the wars of the past, the surviving Lords gave themselves as sacrifice, to give this world one last chance. Now this new world, as fresh as it is, has fallen to the same fates as the one before. You are now thrust into the wars of these nations, having to decide, once again, who will rule the lands of Ethalios. This first set will take you to the Devii, Fuerion, Monger, and Donzio Nations. 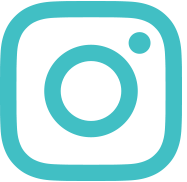 In this game, players will build a clan using characters, environments, and equips to create a winning strategy over their opponent. You will work to build up resources which are used to summon high level tiered cards on the field, and overwhelm the opponent’s clan, claiming victory by taking their throne or destroying their army. Get to your opponent’s throne, and have the opponent end their day (turn) with your character on their throne space to take the kingdom. Overwhelm the opponent by killing their characters and gaining a Scorch Token for each one. After obtaining 10 Scorch Tokens, the opponent is overwhelmed. 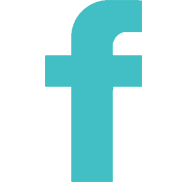 Minimum of 20 character cards, placed on the character deck space. Minimum of 20 support cards (supply cards and environment cards), placed on the support deck space. Maximum of 20 T1+ through T3+, and Legendary supply cards, placed on the tiered space. Skills: Character skills may only be used once per day (most of them only on your day) unless the description says otherwise. Deplete: If a character on the field is depleted, they are turned sideways and may not move, attack, or use an effect during the time period for which they are depleted. Some cards must deplete to use a skill, and some cards have skills to deplete enemy cards. Also, if a character is attacked while in a depleted state, their armor is treated as 0 for damage calculations. Vanquish: If a card has a skill to vanquish itself, or is removed by an opponent, you must remove them from the OOC pile to the side of the war zone board, and they may not be used again during this war. Entrance Effect: If a character has an entrance effect, it is activated as soon as they are set on a space within your war zone. Bleed: If the bleed effect is applied to a character, they lose 1 health at the end of each day. Armor is unaffected. Plague: Like the bleed effect, plague removes 1 health per day, but additionally, at the time of death, that character will become a sub-character. The type of sub-character it will become is listed on the card that is casting the plague effect. Fear: When successfully effected by fear, cards are returned from the field to the player’s hand. Sub-Character: Character cards that are used only by some clan decks. They do not reside in the character deck or in the tiered deck. These sub-characters do not give a Scorch Token when killed, but are affected by everything else, just as a normal character. Acid: Affects armor by either adding tokens to the character to represent how much armor is removed, or by completely removing armor from the opponent. 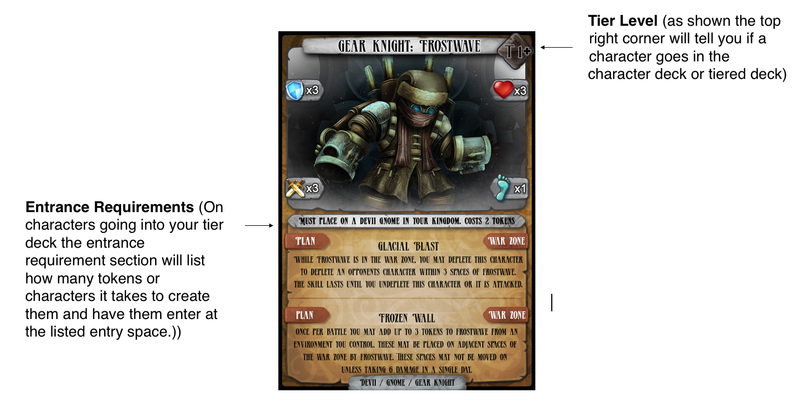 Tokens: Used as the resource management system on the field for creating tiered cards. Hand: Cards in your hand. Some cards will have skills activated from here. Character Cards: All character cards that go in the main character deck are labeled with a T1 in the top right corner. Field Environment Cards: May be placed anywhere on your war zone map. Equip Supply Cards: May be equipped to any of your characters. Only 1 equip may be on a character at a time, unless an effect says otherwise. Field Supply Cards: Like Field Environment Cards, they may be placed anywhere on your war zone board; but not on the opponents, unless an effect says otherwise. Set up their board with their battlefield connecting to the opponent’s battlefield. Separate their deck, placing the T1 characters in one pile. Shuffle and place them on the designated character deck space. Shuffle all of their environment and supply cards, and place them on the support deck space. Place all of their tokens and dice on the side of their field for use once the battle begins. After everything is set up, each player rolls a die, with highest number determining who goes first. On your first day (turn), draw 3 cards from your character deck, and 3 cards from your support deck. You may then draw your 7th card from either deck, depending on what you might need. This last card is considered the gathering phase. Gathering phase: Draw a card from either the character deck or support deck, and add tokens to any of your cards that generate at the beginning of your day. Battle Plan Phase: Your character enters the battle through its labeled entrance requirement space. Some cards will have “special deployment" abilities, meaning they can be added to the field without counting toward your 1 entry per day. Also, you may use any and all support cards, and create tiered cards during this time. Assault Phase: Cards are no longer played unless they have a special effect. During this time, characters move on the field and attack. It does not matter the order in which this is done. 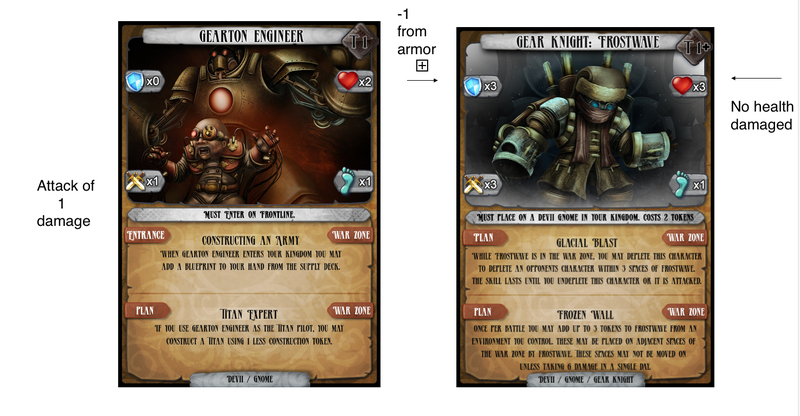 Gearton Engineer would move to an adjacent space of Frostwave to attack. The battle is calculated by subtracting the Engineer’s attack points from Frostwave’s armor points. If the attack removes all of the armor points, the remaining damage is subtracted from Frostwave's health points. If Frostwave's health reaches 0, it is removed from the field; but if it has any health left, it has to retaliate once, going through the same cycle of hitting armor first, then health. Unless an ability says otherwise, that battle is over after the first character attacks and kills another character, or after they receive retaliation. At the end of each day, all armor of characters on the field regenerates so that in the next battle in which they are attacked, the armor must be pierced to do damage. Health is never regenerated unless a skill or support is used to do so. When a character is killed by the opponent, the opponent gets a Scorch Token to use toward an overwhelm win in the war. Scorch Tokens are only rewarded after a kill. They are not rewarded when players intentionally remove their own characters due to deck mechanics. Battle Assessment Phase: Play any cards you need that you did not play during the Battle Plan Phase. You may also add a character to the field, only if you did not add one during the Battle Plan Phase. Night: End of your day and turn. Your opponent takes their turn going through the same cycle. When a character is killed by their opponent, the opponent gains a Scorch Token, which is placed in a line to the side or back of your battlefield board. If a player reaches 10 Scorch Tokens from 10 kills, they have overwhelmed the opponent and win the battle. If you are playing tournament style, then the score for each player is a plus or minus of the difference between the number of Scorch Tokens each player has at the end. Ex: If we were battling and you had just collected your 10th Scorch Token and won the battle, and I had only collected 4 Scorch Tokens during the fight, our scores for this battle, would be a +6 for you and a -6 for me. (10 - 4 = 6, and + or - depending on if you won or lost). This applies both going into the next battle with another opponent, and our next battle, in a best of 3. This way, it is not about only winning or losing, but by how much. So, after 4 battles you may have won 2 battles and lost 2 battles, but your score could be drastically different than another player that also won 2 battles and lost 2 battles, based off of how many Scorch Tokens were collected, making ranking easier. The other main victory strategy occurs by taking the opponent’s throne. If you can get one of your characters onto their throne space, and keep it through 1 of their days, so that they have to end their turn with you still claiming the space, then you have captured their kingdom and won the game. Taking an opponent’s throne cancels out all Scorch Token points. A win by capture of the throne, if playing tournament style, is a +10 to the winner and -10 to the loser, no matter how many Scorch Tokens were in play at the time. That will cover the basics of the game. There's a lot more to cover for individual clans, but this is plenty for one day. There is a video that will eventually go with this post, once I figure out how I broke it. Ill have a couple smaller posts going over the different resources on Monday or Tuesday. As always, let me know what you think and I'll talk to you soon. Oh and don't forget to subscribe below.